Harkness brazenly side-stepped Chinese bureaucracy, and garbed in fur with a cigarette dangling from her lipsticked mouth and a baby bottle propped in hand, she waged a savvy public battle to extricate Su-Lin from his native land, eventually finding a home for him at the Brookfield Zoo in Chicago, where he attracted record crowds: 53,000 visitors the first day, a number yet to be matched. Wonderfully illustrated throughout with 16 pages of black and white photographs taken during Harkness’ journey and of panda, Su-Lin. 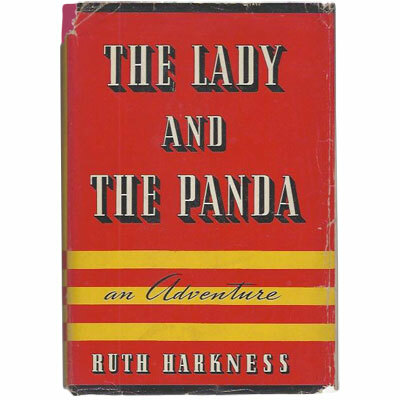 Originally from Pennsylvania, New York fashion designer Ruth Harkness (1900-1947) set out to complete her late husband Bill’s mission to travel to China in search of a panda in 1936. With her entire (albeit minor) inheritance at stake, the 35-year-old boarded a cruise liner to Shanghai, teaming up with young Chinese-American explorer Quentin Young, who later became her lover. Supported by 16 coolies and a cook, the pair barrelled off into Sichuan Province, where in November 1936, they encountered and captured a nine-week-old panda cub. Harkness would return to China and capture more pandas, before bad luck, heavy drinking and regret consumed her. She grew troubled by the hard-to avoid facts behind her greatest success: that her capturing of pandas wrested babies from their mothers and robbed a natural heritage from the loved, risking – and taking – panda lives in the process. She died, of acute alcoholic gastroenteritis, in 1947. References: Croke, The Lady and the Panda 2005. Paul, ‘The Lady and the Panda’ The New York Times 2005.